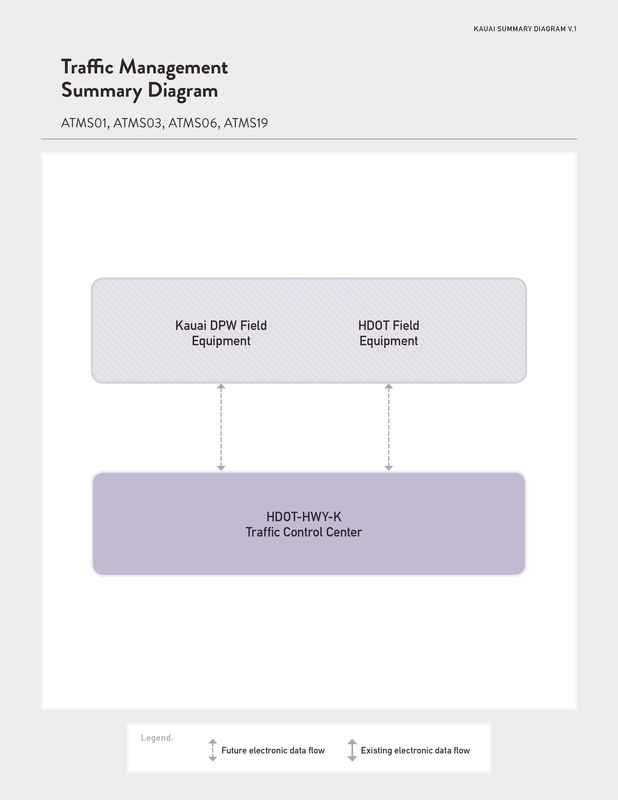 The Kauai Regional Intelligent Transportation System (ITS) Architecture is a planning document for the deployment of ITS devices and systems in Kauai over the next ten years. 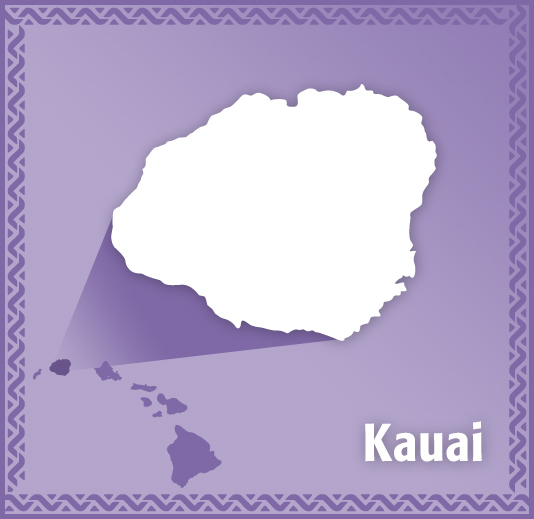 The geographic area for the Kauai Regional ITS Architecture is the island of Kauai. The Architecture has been developed to support ITS project development as well as planning, data collection and analyses functions for State and County transportation agencies. The Architecture can be used by the agencies in meeting federal requirements relating to ITS Architecture and Standards as well as supporting the requirements of MAP-21 and State or individual County transportation planning processes. Using the information from the interviews, operational concepts that identify the roles and responsibilities of the participating agencies and stakeholders in the operation and implementation of the systems were formalized. Agency desires for future ITS were compiled into a list of projects, with a ten-year horizon. The stakeholders were invited to review the information at a workshop held on September 9, 2015. 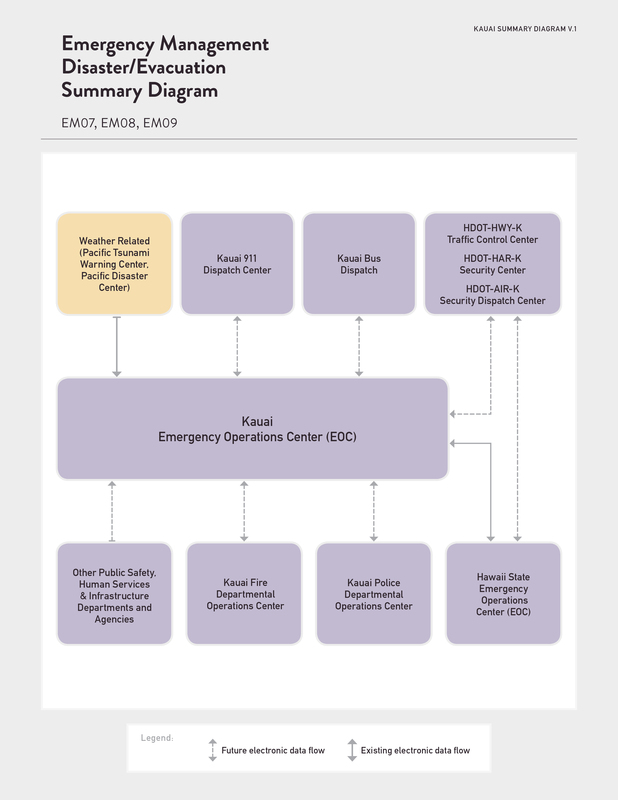 As a result of their review and discussion, a draft version of the Kauai Architecture was created for agency review and comment. Comments received from the stakeholders have been incorporated into this final version of the website. Stakeholders: A comprehensive listing of all of the agencies that own, operate, or maintain elements (or systems) in the architecture. Inventory: Information about the elements or systems that make up the architecture listed alphabetically or sorted by stakeholder or type of element. Services: Based on the National ITS Architecture framework, this section presents detailed service diagrams tailored to each agency. Architecture: Organized by element name (including references to agencies), this section provides the elements of the architecture and shows the information flows between elements. Projects: A complete list of the near-term (likely to be completed in the next five years) and long-term (likely to be completed after five years) organized by project name and stakeholder. Resources: This section provides details about how the information is organized and how to find and use architecture information on the website. This section also contains links to other architecture and ITS standards sites. Feedback: Use this to provide general comments about the architecture to HDOT. 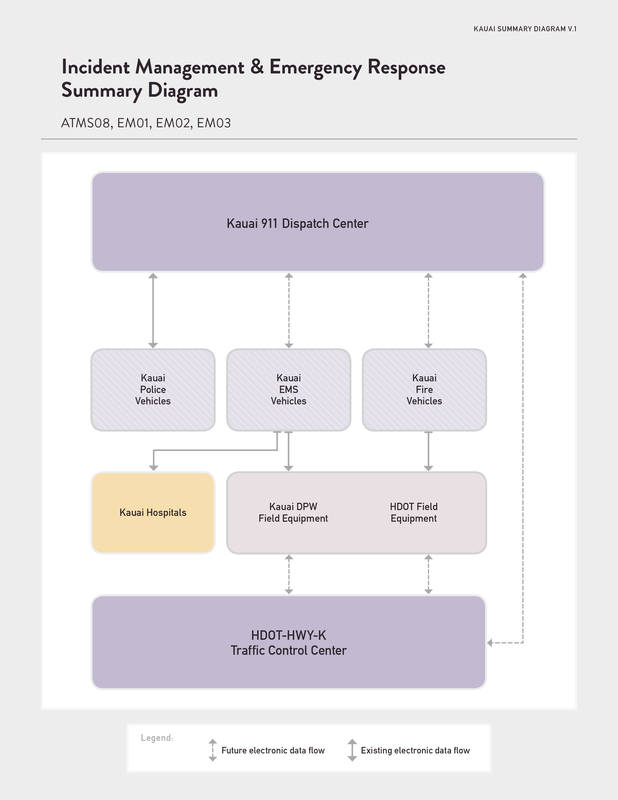 The summary diagram for regional traffic management shows that the State of Hawaii bears primary responsibility for traffic control in Kauai. However, the County of Kauai expects to coordinate with the State of Hawaii to plan and deploy ITS projects on county roads. Currently on Kauai, most signals are operated independently by the State, although the County operates signals on county roads. The County Department of Public Works expressed a desire to have their traffic signals controlled by HDOT Highways Division from a future traffic management center, and this was confirmed by HDOT Highways Division. Both agencies would like to add closed-circuit television (CCTV) cameras, dynamic message signs and other ITS field equipment that is used to enhance traffic operations, and ultimately provide real-time traffic information to the public. Traffic incident management consists of a planned and coordinated multi-disciplinary process to detect, respond to, and clear traffic incidents so that traffic flow may be restored as safely and quickly as possible. The summary diagram shows that the State and County plan to use new traffic devices to assist in incident detection. Already, signal pre-emption technology is used by Fire and emergency medical services (EMS) to change the traffic signal from red to green when fire trucks and ambulances are responding to a 911 call. Kauai Police vehicles are equipped with mobile data terminals (MDTs) that are connected to their computer aided dispatch (CAD) system, and are desired to be added to fire and EMS vehicles in the future. The Disaster Response and Recovery service package enhances the ability of the surface transportation system to respond to and recover from disasters. It addresses the most severe incidents that require an extraordinary response from outside the local community. All types of disasters are addressed including natural disasters (hurricanes, earthquakes, tsunamis, etc.) and technological and man-made disasters. As shown in the summary diagram, the County's Emergency Management Center (EOC) is at the center and coordinates between multiple agencies and entities in response and recovery. Depending on the severity of the event, representatives from public safety, human services, infrastructure agencies and private utilities each have seats at the EOC to ensure a collaborative response. The interfaces between the EOC and first responders and transportation agencies provide situational awareness and resource coordination. When activated, Kauai's EOC provides wide area alerts and disaster traveler information to the public electronically through its website, social media and subscription notifications. Kauai Bus assists in the evacuation of the people as needed. The HDOT Harbors Kauai District is currently constructing a statewide monopole system that will allow communications between the State Harbors as well as provide a communications link to the EOC of Harbors operations during a disaster event. This summary diagram shows the collection of data -- traffic conditions, advisories, incident information and the like -- broadcast to the public. The automatically generated information is likely to include images from County and State traffic cameras, incident alerts and a congestion map. HDOT currently operates and maintains the GoAkamai traveler information system on Oahu and it is envisioned that traffic information from future ITS deployments on Kauai will be published on GoAkamai's website http://www.goakamai.org/and mobile app. The Hawaiian language uses two diacritical markings. The 'okina is a glottal stop; and the kahako is a macron. The State of Hawaii strongly encourages the use of Hawaiian diacritical markings. The National ITS Architecture tool, Turbo Architecture, does not allow for the Hawaiian diacritical markings to be input and as such, customized service package diagrams, operational concepts and other outputs from Turbo are unable to reflect the diacritical markings. To ensure consistency in this ITS Architecture website, no Hawaiian diacritical markings will be used.